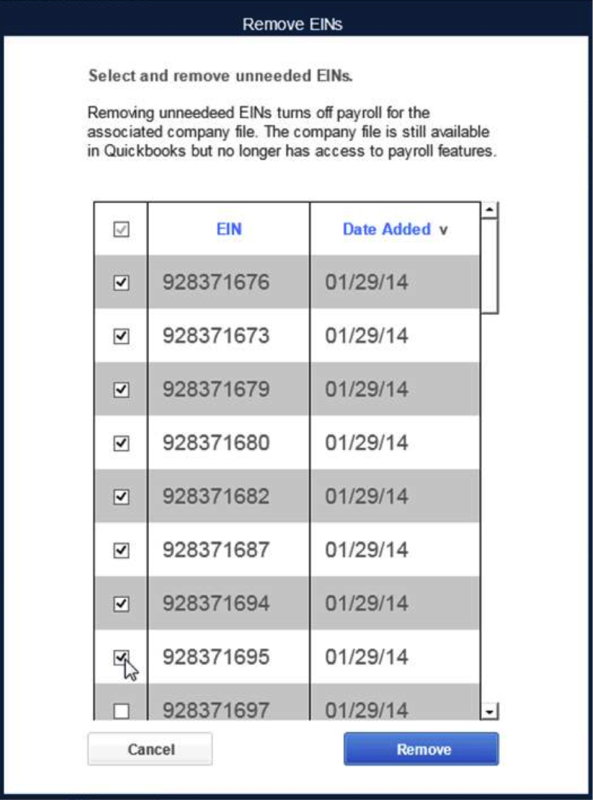 If your Intuit® Payroll subscription (or the subscriptions of your clients) for Enhanced Payroll for Accountants, Basic, Standard or Enhanced Payroll contains EINs that are no longer used or needed, you can easily remove them through the EIN management tool. Just follow the steps described below. When you remove an EIN from a payroll subscription, access to year-end activities, such as filing W-2s and other payroll tax forms, will be disabled for that EIN. The Direct Deposit for Payroll service and the Direct Deposit for Vendors service also will be deactivated for that EIN. To access the EIN management tool, log in to Account Maintenance (from the Employees menu, select My Payroll Service and then select Account/Billing Information). The Service Information section displays the number of EINs allowed with the payroll subscription. 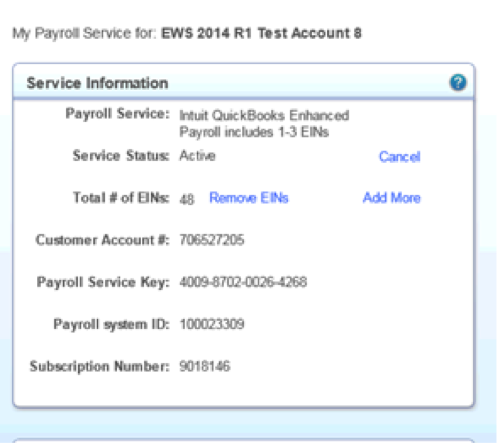 If there are multiple EINs, the Service Information section will also indicate the total number of EINs currently active on that payroll subscription. The EIN management tool includes a built-in safeguard: When you access Account Maintenance from a particular company, you cannot deactivate the EIN for that company. To deactivate that EIN, you must first switch to another company. However, the EIN management tool does not have the ability to reactivate EINs. Removing EINs is not intended to be temporary. If you’re an accountant or ProAdvisor and have multiple Intuit Payroll subscriptions, you must access Account Maintenance from a company file that is using the same subscription as the EINs you would like to remove. To reduce the number of EINs, click Remove EINs in the Service Information section. 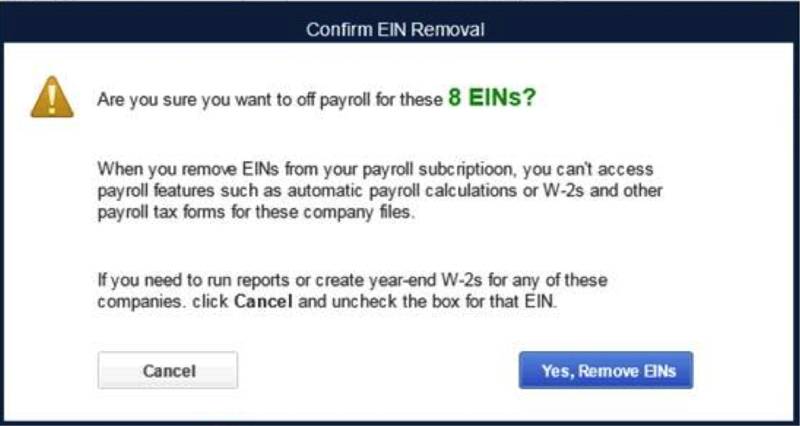 Then select the EINs that should no longer be associated with the payroll subscription, and click the Remove button. To prevent accidental deactivation, you will need to confirm your choice to continue. After you remove the unneeded EINs, the total number of EINs will be updated in the Service Information section of Account Maintenance.